We all know that the Camino de Santiago ends the homonymous Galician town, but what not everyone knows is that there are several alternative routes of pilgrimage and one of them starts from the very center of the Iberian Peninsula. 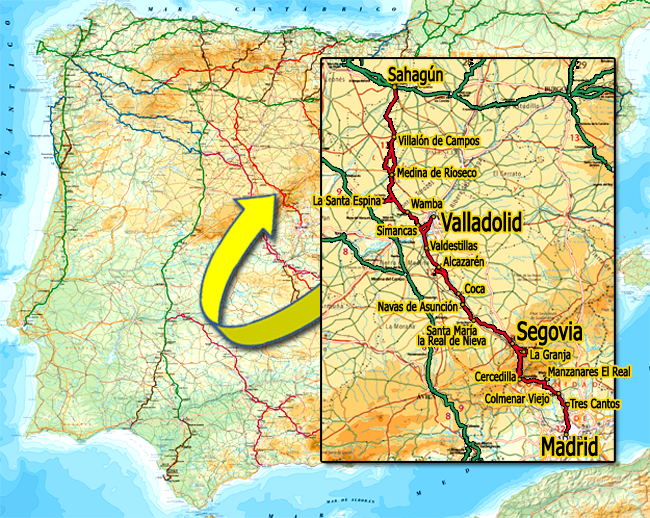 The Camino de Madrid starts from the Puerta del Sol, the Kilometer Zero of Spanish roads, through the peaks of the Sierra de Guadarrama, cereal fields, the Canal de Castilla, the castles and Romanesque churches that draw our history reach Sahagún and connect with the original path of the Way. Cercedilla, Coca, Olmedo, Medina de Rioseco or Peñaflor de Hornija are some of the localities of passage of this legendary path that we will taste on our bicycle.